Most of us have a drawer, somewhere in our house, which contains all sorts of odds and ends. In my house it was always the “miscellaneous” drawer, others call it a “junk” drawer. 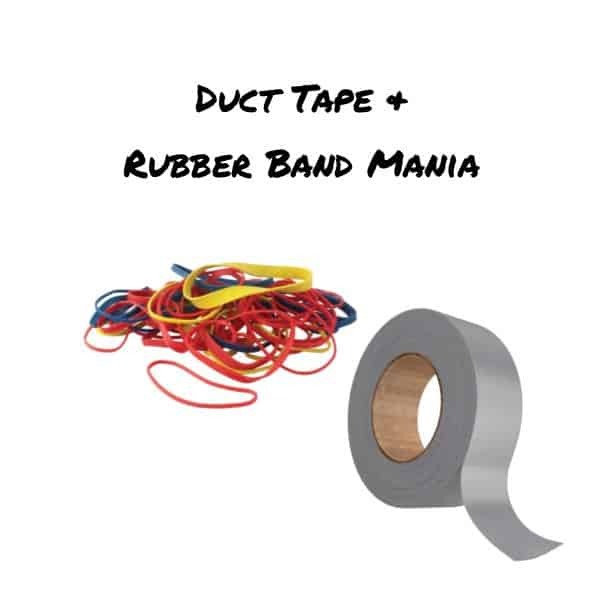 Whatever you call it, I bet you have duct tape and rubber bands shoved in it – and maybe some glue sticks, a cork or two, craft sticks, straws, etc…. 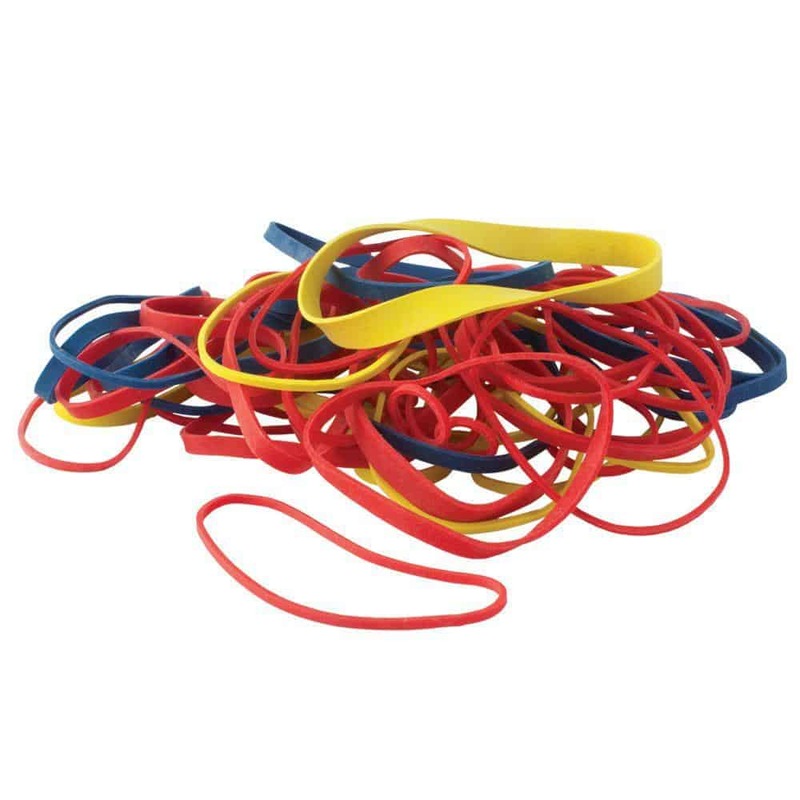 Did you ever just look in that drawer and say “wow, I could make a catapult with this stuff!”? You may not have been thinking that, but you could! And with some heavy-duty shipping boxes – you could make a bedroom set. Really. 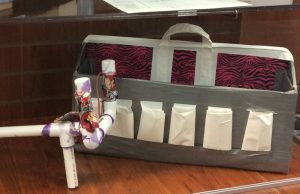 Check out our new exhibit – The Duct Tape and Rubber Band Engineer – and see just some of the cool things that can be made!! 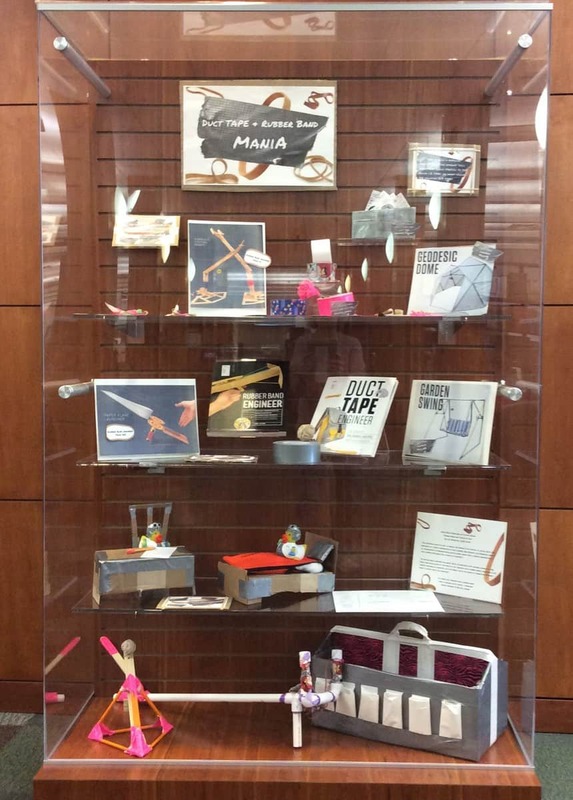 Duct Tape & Rubber Band Mania Exhibit! 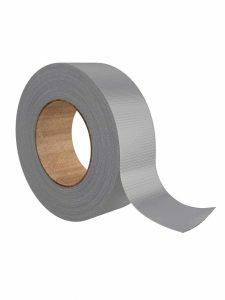 Duct tape can be used for lots more things that taping your favorite shoes back together or holding the fender on your car while rubber bands have a lot more uses than holding your hair back or holding a bunch of pens or pencils together. Okay. You’ve got duct tape and rubber bands from your junk drawer. Now what? Pick out a project! A “Rubber Band Rocket” is pretty simple (simple enough that I did it!) and a good way to start your tinkering. 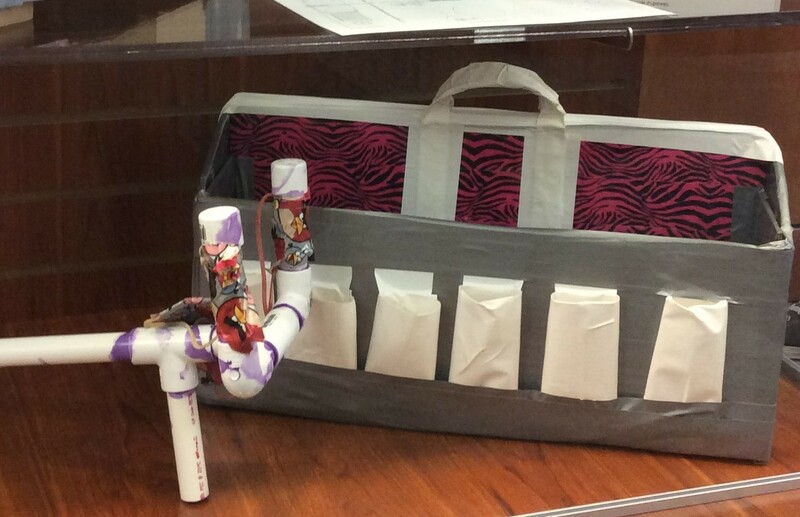 From there you can move on to the more complex “PVC Slingshot Rifle,” (a project James took on!). 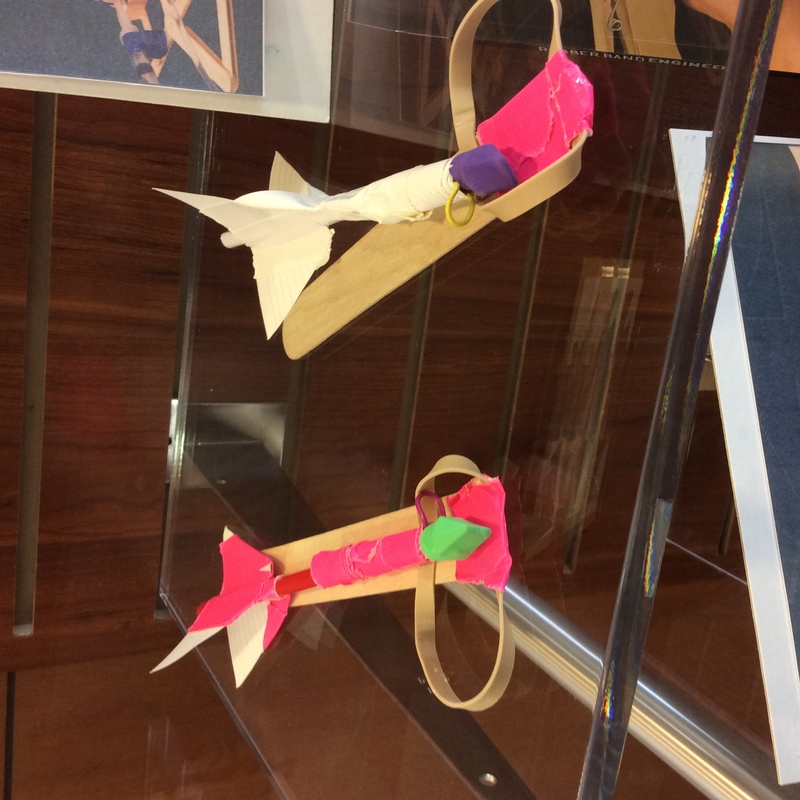 You can make the “Pyramid Catapult” (which I did, with James’ help) or make an “Enhanced Mousetrap Catapult,” (which none of us tried!). There are also instructions for a “Floating Arm Trebuchet,” a “da Vinci Catapult,” a “Robot Arm,” and “Hydraulic Fighting Robots,” for more serious tinkerers! All projects come with a list of items needed (and possible alternatives) with clear written and pictorial instructions! Check out this video of a simple rubber band rocket! Akiyama also takes you through taping techniques, including surface preparation and the best way to get the maximum adhesion. Making a duct tape sheet is important when using tape as fabric and he explains step-by-step and with full-color photographs. 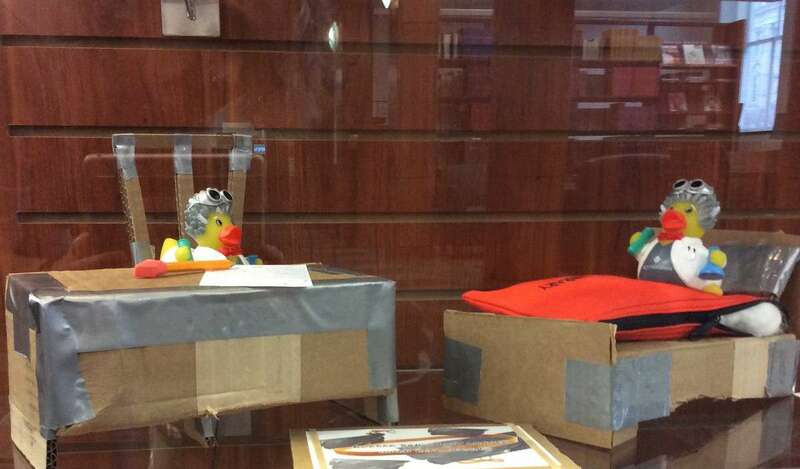 Just 2 ducks (get it?) hanging out, studying and resting on their cardboard & duct tape furniture! Next step: furniture!! The first piece of furniture is a desk chair. The list of materials needed includes (but isn’t limited to) heavy duty, double-thick cardboard, white glue, and ruler (and don’t forget the duct tape!). There are detailed instructions and drawings explaining the process – and suggestions for tinkering and making it your own! Once you get that under your belt, move on to making a desk to go with your chair. Again there is a parts list, detailed instructions and detailed drawings. Want to make all your furniture for your space? Besides the desk and chair, there are instructions for a dresser (with working drawers! ), and a bed frame! Voilà! You have furnished your bedroom! Hard to believe? Check out our exhibit and see the mini-sized furniture! Like to kayak? There really are step-by-step instructions explaining how to build a kayak that, if properly constructed, will hold around 200 pounds in still water. You might want to test it in shallow water first! How about a lovely garden swing, just right for two people? That’s right, Akiyama shows you how! Need a hammock, too? Instructions, complete with how to create the ribbing with duct tape! 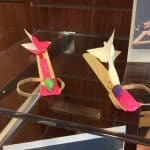 Stop by and see the exhibit and the fun things you can make with simple household items!